Lakitu Launch is a minigame in Super Mario 64 DS and New Super Mario Bros.. It is one of Wario's minigames in Super Mario 64 DS and an Action minigame in New Super Mario Bros. The player must use the stylus to slingshot Spiny Eggs in the giant Green Shells the Lakitus are carrying. If the player shoots many Spiny Eggs into the same Green Shell, it will drop to the bottom of the area temporarily, possibly allowing the player to earn a few quick extra hits. At the end, the Spinies will jump out of the shells and will be counted. The multiplayer version of Lakitu Launch is Vs. Lakitu Launch. The 1 on 1 version of the same name, however, is completely different from the single player version. New Super Mario Bros.: Shoot as many Spinies as you can into the tubs within the allotted time. 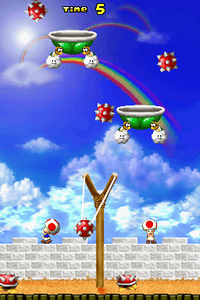 Super Mario 64 DS: Shoot as many balls as you can into the tubs within the allotted time. The music used in the minigame is a remix of Big Boo's Haunt's "Merry Go Round". This page was last edited on February 15, 2018, at 17:00.